Looking for movie tickets? 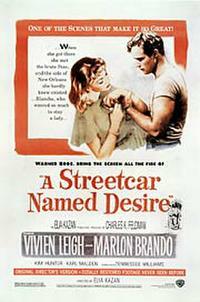 Enter your location to see which movie theaters are playing A Streetcar Named Desire (1951) near you. A STREETCAR NAMED DESIRE. Director Elia Kazan’s powerful adaptation of Tennessee Williams’ classic play made Marlon Brando a household name for his incendiary portrayal of working-class Stanley Kowalski, who collides headlong with fragile Southern belle Blanche DuBois (Vivien Leigh) when she moves in with him and wife Stella (Kim Hunter), her sister. "Stella!" classic is powerful tale of abuse, alcoholism.